I am a native of Trinidad in the Caribbean. Several decades ago when making my first trip to the U.S., I read about snow and thought about white, fluffy stuff in the sky. Before coming, I practiced holding ice in my hands for long periods of time to give myself an idea of what it’s like. I thought myself quite knowledgeable about what winter must feel like, considering I never had reason to own even a sweater for warmth. To my surprise, I arrived in New York City in February to find six inches of snow on the ground. You can imagine the culture and climatic shock I experienced. It’s the same reaction you might have when you witness the environment of child-headed households. Can you picture an 8 year old managing a household with two siblings? Like me, unless you have a real life frame of reference, you could not begin to envision that reality. 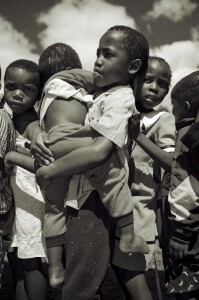 This is why I secured sponsorship and engaged the extraordinary talent of various artists to create an incredibly moving and dynamic coffee table book, The Hope Seekers –Survival of Southern African Child Led Households in the Shadows of HIV/AIDS. Meet the Hope Seekers, up close and personal. Enter their incredible lives. Through stunning photography, informative narrative and moving anecdotes, witness their stories for the first time. There are seventy copies of the preliminary inventory left and would like to see them distributed soon. For each contribution of $100, SOHO will send you a copy. Proceeds from the book go toward programs as well as provide food, education and health care for the children who so desperately need your acts of kindness.heir stories for the first time. The book is uplifting and beautiful because it captures their stubborn hope in every page. To order, simply visit The Hope Seekers on our website. On behalf of the children, I extend my sincere thanks.